It’s Spring, it’s spring! Well…the calendar says it’s spring. There are leaves on trees, dogwoods blooming out in the woods, azalea blossoms everywhere, and pine pollen putting a fine, yellow dust on everything. Cue Coldplay’s “Yellow!” Because it is all yellow. Ending up in bed for two days means I started and finished several books. These, on top of another stack I read, make up my “Books I Read This Winter” list. The Bear and the Nightingale, Katherine Arden – This was a very compelling and beautifully written but dark book, set in rural Russia at the end of the medieval period. The Russians held many beliefs about household spirits, similar to the light-hearted treatment of the Scandinavian “Tomten” that guards the house and gave favor to it if the house is well cared for, or the Irish Faeries that look favorably upon a household if milk is left out for them. However, the Russian household spirits were numerous and called “demons” so that definitely adds a darker feel to the whole thing. Katherine Arden lived in Russia and studied their history and culture deeply, and her immersion is reflected well in this seamless and fascinating novel. This is part fairy tale, part historical novel, and does require you to suspend all reality and accept it for fantastical, or you will probably hate it. I loved it, however, and couldn’t put it down. Bel Lamington, Fletcher’s Inn, and The Blue Sapphire, by D.E. Stevenson. I believe I’ve written ad nauseum about how I adore this author’s work, so I’ll not elaborate here, except to say I liked Bel Lamington, thought Fletcher’s Inn a rather weak sequel, and really enjoyed The Blue Sapphire. I wouldn’t put any of these at the top of your D.E. Stevenson list if you’ve never read her work. Start with Miss Buncle’s Book or Listening Valley or Mrs. Tim of the Regiment. Where the Forest Meets the Stars , Glendy Venderah- Whew, this book was a page turner! It reminded me a lot of Ann Patchett’s State of Wonder, as far as atmospheric setting and some similar content, but was more personable when it came to characters and fast paced. Some hard, real life things came up in this book, and the characters’ values are certainly not my own life values. I’d give it a solid PG-13 rating (and it does, in fact, read like a movie in my opinion), but I really enjoyed it. Becoming Mrs. Lewis, Patti Callahan – I had no intention of reading this novel of the relationship between Joy Gresham and C.S. Lewis when I first heard of it. It felt like sacrilege to touch these real people and their relationship with fiction! Then I heard Mrs. Lewis’s son Douglas Gresham talk about the book in an interview. He said that he had become friends with Patti Callahan during the writing of this book, that he really liked the book, that he found it more true to life than many other accounts of Joy Gresham, and that he thought it was a well-written and delightful novel…well, gee, he convinced me. I decided to read it. And I fully agree with him, it’s a great book! I highly recommend it, especially if you’re a Lewis fan. Becoming, Michelle Obama – I think Michelle Obama’s memoir was an important book for me to read. Through reading it, I got to know the former first lady and former president as people instead of merely as political figures. Their backgrounds shaped so much of what they cared about in politics, and that was good for me to understand where they’re coming from, whether I agree with them on all the issues or not. It was eye opening in many ways, and I really enjoyed learning about Michelle Obama’s background and her journey from a lower-income Chicago neighborhood to the White House. I think my husband got tired of me interrupting his own reading to say, “Did you know that…..” so many times. Michelle Obama has a great writing style, and a kind tone towards all people in her book. Book Girl, Sarah Clarkson – Several times as I read Sarah Clarkson’s memoir about the way books have shaped her life, I felt like I was reading my own story. Almost all of the same books that impacted her are the ones that have impacted me, from childhood to adulthood. She is more eloquent than I am, however, when it comes to explaining the deep effect these books have had on her. I can highly recommend her book and all of her book recommendations in it. There were some she recommends in her booklists and friend’s booklists that I haven’t read yet, and knowing our book tastes are almost exactly the same, I’m moving them to the top of my reading list. The Quotidian Mysteries: Laundry, Liturgy, and Women’s Work, Kathleen Norris – I didn’t love this book as much as I expected to, but I’m still glad I read it. It was thought provoking and a good reminder of the beauty and call to worship that is available in our everyday lives. Norris has a friendly, thoughtful tone and unique insights. However, this book remains cerebral and somewhat academic. It is not dry or lifeless, but it is very inwardly focused and you can tell it is written by a person who has led a life spent in times of long quiet and contemplation. Norris did not have children, and I have four, so my homelife is very different from hers. Several times I found myself thinking “but I have children around all the time!” as I read her work. Still, it was definitely worth reading and possibly re-reading in the future. that was fascinating and inspiring. I don’t plan to start wearing long dresses and dipping candles, but embracing simpler living and building beauty into everyday life, along with a deeper connection to nature in daily routine, definitely appeals to me. Her words quoted throughout are full of wit and good sense. The photos are beautiful, as well! I sat down with this book on a cold Sunday afternoon and read through it in a pleasant hour. House of Dreams: The Life of L.M. Montgomery, Liz Rosenberg – L.M. Montgomery’s books are up there with The Chronicles of Narnia as my favorite books of all time (if I’m forced to choose!). I’ve skimmed through a few biographies of Montgomery’s life, but have never found a satisfactory account of her outer life and inner life (think journals plus facts) combined until now. Rosenberg’s tone and writing style are just perfect for taking readers through the ups and downs of Montgomery’s life without sinking into melodrama. She writes about Montgomery with admiration and respect, but keeps her tone light and not overly passionate, as some biographers can be. House of Dreams is easy and enjoyable to read, suitable for young adults, and well researched. Also, Julie Morstad’s illustrations make me slightly giddy with their perfection. The Phantom Tollbooth, Norton Juster – We all laughed a lot in this book, but especially Ella (9), who understood the word play. Isaac (7) liked the story, but much of it was over his head. Since reading it, we’ve talked many times about how Milo, the main character, went from bored and in a hurry for no reason at the beginning of the book to curious and interested in everything by the end, and how much more he enjoyed life after his adventure. Caddie Woodlawn, Carol Ryrie Brink – Oh, this book. As I read this aloud to my kids, I remembered over and over again why it has kept a strong hold on my heart all these years. It’s such a perfect book – a mix of danger and adventure, complex yet lovable characters, compelling history, and relationships between family, friends, and neighbors. I choked up so many times reading it, and it’s not even particularly sad, it’s just that powerful. Brink is one of those amazing writers who doesn’t have to explain what the characters are feeling, but conveys deep emotions just the same. And let me tell you how much my kids loved it: after we finished it together, they immediately got the audio book from the library and began it over again. I call that a hit. Violet (4.5 going on 10) says it’s her new favorite. (Caveat: she has said that about The Secret Garden, The Boxcar Children, Pippi Longstockings, and many other books…she is a story lover to her core). The Railway Children, E. Nesbit – We’re halfway through this one and we look forward to reading a chapter of it every day. I have to confess, I have never read E. Nesbit, as a child or grown up. This is a terrible, horrific oversight and 2019 will see a complete remedy of it. I’m thinking about watching the movie adaptation of The Railway Children when we’re done reading the book. Ideas on which version is best are appreciated! And that wraps up the books that saw us through Winter, 2019! Of course, we read many, many picture books with the little two as well, but that’s another post for another time. 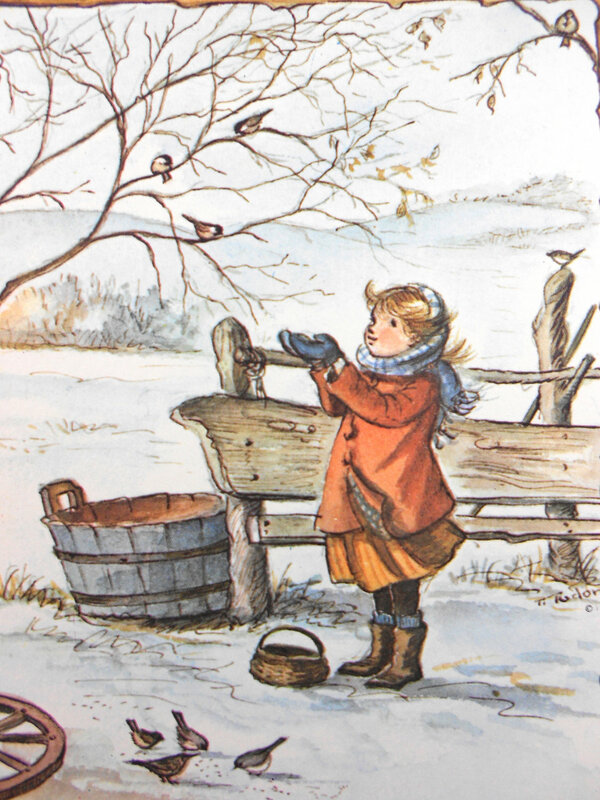 I hope your winter was a good one and that spring treats you well and brings lots of sunshine and great books your way. Happy reading!